← What is an Adventure Motorcycle? This is the third and final post of the more power, more adventure and more scramble series of posts regarding what’s trending in the motorcycle world in 2015. Are we experiencing a revolution in the motorcycle world? Adventure motorcycles are here to stay with more models being launched every year and with an increasing level of sophistication in the last few years. There are interesting developments in sport bikes with the introduction of the Ducati Panigale a few years back and this year we have the supercharged Kawasaki H2 and several other sport bikes surpassing the 200hp mark. There is no question, adventure and sport bikes are experiencing sales growth, and they are essentially where you find highest power developments and the highest level of technology on the motorcycle world. Despite all this increasing level of sophistication and power, standard and retro-styled motorcycles have gained popularity on motorcycle shows and forums these last few years. It is a counter culture of sorts when you juxtapose it to the increasing sophistication of adventure and sport bikes of late. Of this group of motorcycles the scramblers appear to be the most popular. And among them, the Scrambler Ducati seems to be by far the one gathering the most interest among veteran and new riders alike. Ducati’s campaign for its Scrambler proposes the joy of riding theme. The bike and its campaign seems to resonate very well with many riders! With the popularity amassed by the Scrambler Ducati in shows last fall, with healthy sales volume now that it it hit the showrooms, mean this bike will influence or change the industry’s course? Or is this just another new bike wave that will come and go? Although the Scrambler Ducati was the undisputed sensation of the international motorcycle shows of last fall, we all know this type of motorcycle is far from something new. Triumph and Moto Guzzi have been offering standard motorcycles which have evolved very little through the last 50 years and both Triumph and Guzzi have offered a Scrambler variant to these models. What’s new is how Ducati has approached it and how Ducati organized a broad marketing campaign for this product using various media alternatives, and with that targeting people who do not fit the profile of the motorcycle consumer of late. It certainly took the Scrambler idea out of its small niche and put it on the map for everyone to see and to fall in love with motorcycling for the first time or all over again. Categorizing motorcycles in large groups we have cruisers, sport bikes, touring bikes, and dirt bikes. And all of these bikes have their DNA traced back to “standard” bikes. Variations on the theme occur of course and we have sport-touring bikes which are a hybrid between the two types that make the name, we have enduro motorcycles which are dirt bikes re-purposed for endurance off road races (what came first enduro or dirt-bikes, actually? ), we have dual purpose bikes which are street legal dirt bikes that will ride well on pavement. More recently we have the adventure motorcycle, which can actually be a mix of several types of motorcycle as long as it can take you on long distance travels, carrying gear, is comfortable, and can be ridden on various types of roads. Most of the types of bikes and their variations have started with motorcycle owners making small changes to their motorcycles to adapt them to their needs, be it to ride them on dirt, or for road racing or for long distance travel. The latest variations on the theme are the cafe racers, which are mostly home made customization of standard bikes to look like vintage racer bikes. We have supermoto bikes which became a category of bikes when many owners turned their dirt bikes into urban hooligan machines by installing 17 inch street wheels and tires on these bikes. And the list goes on all the way to custom cruisers and a few other customizations. Some of these types of motorcycles have become popular enough to be endorsed by manufacturers, and be built in large enough numbers such as is the case of the Ducati Hypermotard as a supermoto, or the Triumph Truxton as a Bonneville variation in a Cafe Racer guise. Riders have been racing motorcycles since probably the invention of the motorcycle – again what came first, right? The first documented races were either on bicycle flat tracks or on hill climbs, and England was just the likely scenario. To Scramble: Make one’s way quickly or awkwardly up a steep slope or over rough ground by using one’s hands as well as one’s feet. Scramblers were probably the first type of variation made to motorcycles, when owner made modifications to standard motorcycles were made so they could race them on dirt roads – perhaps as early as 100 years ago. Whatever we call it, it will be a hare old scramble! The Scramble name stuck for the races and the motorcycles used in these events became the scramblers. Eventually the industry caught on and produced bikes designed specifically for the dirt and eventually we got the trail, motocross and the enduro bikes, essentially turning the Scramblers into a dead end or branch on the evolution tree of motorcycle types. The same happened for the hare scramble races, becoming mostly locally organized races while motocross and enduro races gained international popularity. However, the Scramblers never disappeared from the radar. And although they became mostly a side bar to the conversation, they never stopped being created. They gathered momentum with street consumers in the 60’s and 70’s, but it was not enough to turn them into mainstream motorcycles. Home made Scrambler creations remained viewed as cool bikes and Triumph’s machines became the standard of choice for such creations and eventually Triumph launched a Scrambler as a factory model. 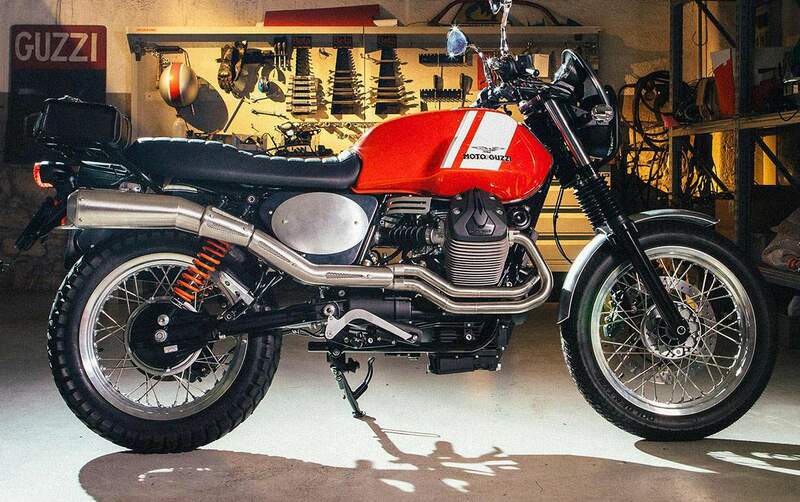 And now Moto Guzzi offers several levels of scrambler kits to its V7 motorcycle. 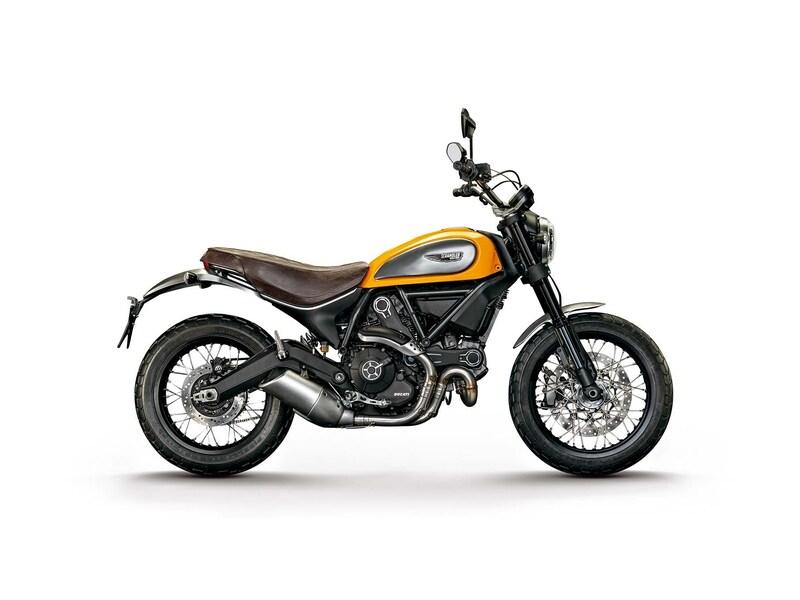 And of course, we have now the avalanche of enthusiasm for the re-released or new Ducati Scrambler. Te Scrambler Ducati can be interpreted as a re-lease of the bike because Ducati had a scrambler model in the early 60’s which was actually built by Ducati based on customer and motorcycle dealer request. It was rather successful in its time, however its production ended when Ducati started its L-twin motors and road race success ensued. 50 years later, caching on the regained “cool” factor of these bikes, targeting a brand new generation of people with no previous interest on motorcycles, and reminding us about the joy of riding, Ducati brought back the Scramblers to the market. More than that, Ducati’s campaign and the motorcycle itself brought the idea of a Scrambler motorcycle to a level of popularity not seen since the 60’s. And it could be bigger than that. The King of Cool loved these bikes! The Triumph Bonneville series of motorcycles are perhaps the most popular base for building a Scrambler, as mentioned earlier. So much so that Triumph has had an official Scrambler model based on the Bonneville for many years already. Steve McQueen rode several of these bikes in scrambler form and owned several of them and put them to real use on several dirt races before turning into more purposefully built dirt bikes. 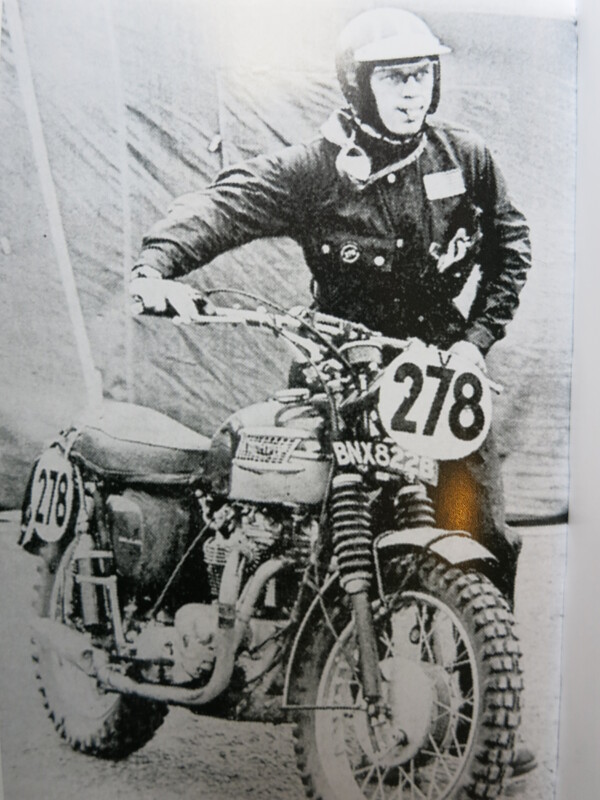 McQueen rode at the edge of the change from Scramblers to dirt bikes, and he eventually owned Husqvarnas and Hondas and other bikes that could no longer be called Scramblers. They were purposefully built dirt bikes. Back to the Scrambler, the most famous of the Bonnevilles, disguised as an older motorcycle, was a co-star with Steve McQueen in the Great Escape film. Who hasn’t seen this film and this scene? You can buy a 2015 Scrambler Bonneville today. It doesn’t look much different from the original 1950’s bikes with the parallel twin with a 270 degree crankshaft motors. You can ride a motorcycle that is basically what the King of Cool used to ride in the 60’s. Despite the classic styling, the Bonnevilles are updated machines with fuel injection motors. However, they still ride on a five-speed gear box and no ABS option is available. There is no question that Triumph will benefit from Ducati’s campaign and the resulting renewed interest on Scramblers. However we need to keep in mind that Triumph is about to make modifications to its Bonneville line to comply with 2016 regulations for the European market. 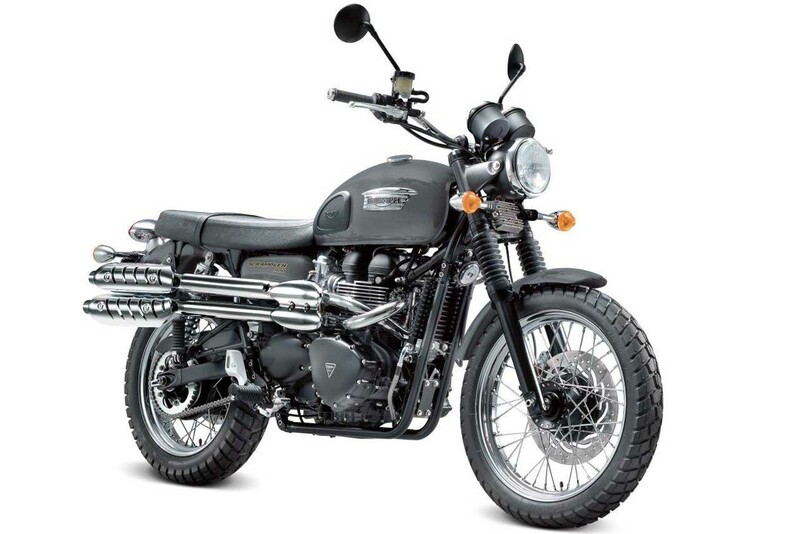 Depending on how far Triumph will need to go with the changes to have its old Bonneville line comply (some say it will be water-cooled and it obviously will have ABS), it may impact the Scrambler line, first in Europe, and eventually here as well. Whatever the outcome is, we can’t imagine Triumph without a traditional looking Bonneville in its line of products. After all this bike is the thread between the old and the new Triumph company. We expect Triumph not to stray too far from these classic lines, and we expect a Scrambler will remain available. Moto Guzzi has held its place in the history of standard motorcycles. The V7 machines have kept the V twin motor, transversely mounted, shaft-driven to today. With its 750cc 90 degree V motor this is a vibey machine of old, and some riders like it exactly for that. Want to talk about the joy of ride? 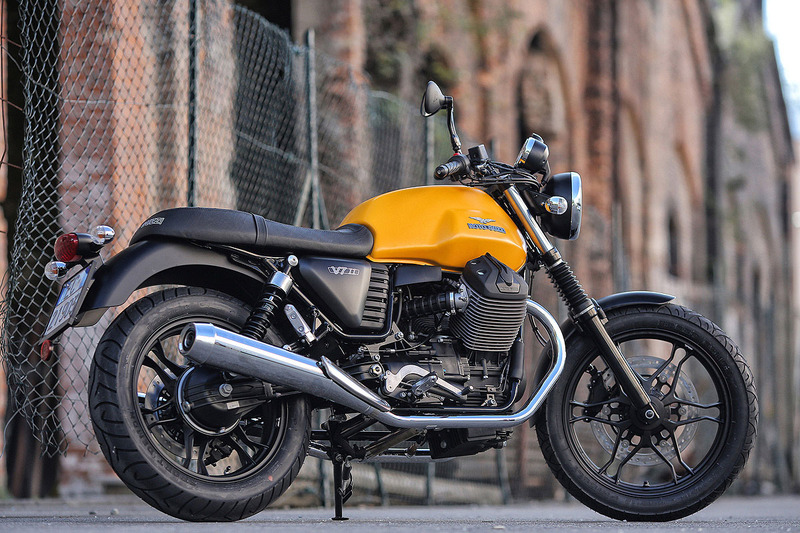 There is something there, that Moto Guzzi offers and others don’t. Want performance? Look elsewhere. Having said that, the 2015 model, the VII, comes with a new 6-speed gear box, ABS and traction control. That is, you get the old style, a basic motorcycle, and it comes nicely updated. Owners have customized this bike in several shapes, including the Scrambler mode. Banking on the Scrambler frenzi, Moto Guzzi has prepared a set of accessories that will make this machine into a very nice looking Scrambler in 2015. Indeed, it is a very nice looking machine. Although the Ducati is using cues from its 1960’s and early 70’s Scrambler, the new Ducati Scrambler is a completely new machine. 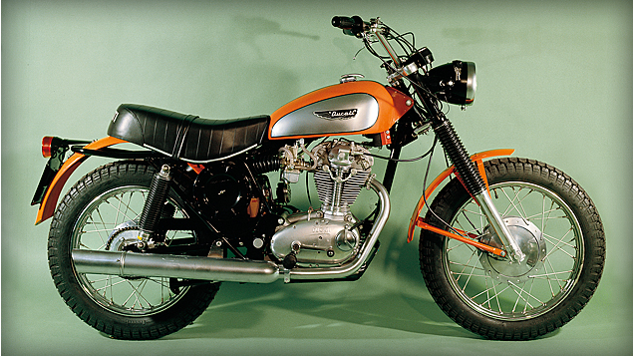 The origin of the 60’s Scrambler, as mentioned earlier, was the result of pressure from an American sales representative, indicating there would be a demand for such a bike. Ducati built it based on single cylinder motors (as the one depicted above), it became rather successful in the United States and eventually in Europe as well. However, when Ducati developed its L-Twin motors for the race bikes, and won GP races with it, things changed. The L-twin motor’s success on the track and then on the sport bikes of the time became synonymous with Ducati and eventually led to the end of all Ducati singles and with that to the end of the Scrambler line. Ironically the only air-cooled L-Twin motor in Ducati’s line, the one that most resembles the motor that essentially killed the Ducati singles and eventually the Scrambler of the 70’s, is now the motor on the new Scrambler. However, today’s Ducati scrambler is the one with most power when compared to the Triumph and the Moto Guzzi machines. It also is the lighter and has longer suspension travel when compared to the other two. 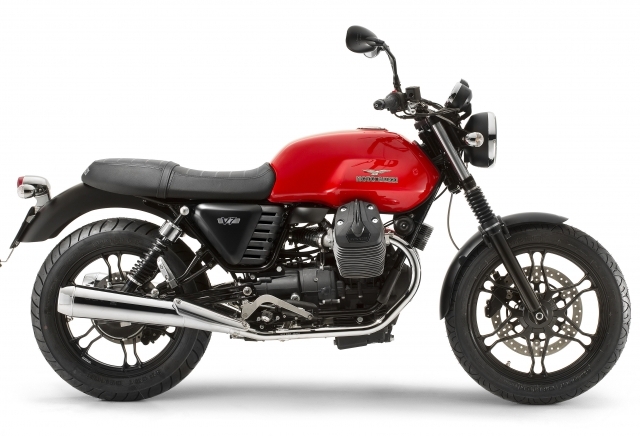 And like the Moto Guzzi, it has a six-speed box and ABS. No traction control for the Ducati, though. The main idea is the going back to basics. I cant wait to test ride one of these new Ducatis and see if it will evoke the joy of riding. The V-Twin motor, no rider aids, no fairings or wind screens, and all of that on a very light and nimble motorcycle… I think it will deliver the joy of riding in spades. So what? A revolution, you said? There is no denial on the power of the Scrambler Ducati campaign. I’ve heard Ducati has temporarily re-purposed its production line to build more Scramblers and satisfy the strong demand for this model. Not all show rooms have this bike on the floor yet and we already hear speculation about more Scrambler models being discussed at Ducati. Is this a new movement? Will we see more “simple” machines, variations not too far from traditional standard machines being designed and produced? Will Scramblers finely come out of its niche to become a mainstream type of motorcycle? I doubt these scenarios will materialize themselves now and in years to come. Personally, I have no expectation that Scramblers sales are going to be sustained in the long term. Riders will continue to buy or show interest on bikes with the highest level of sophistication. Power will remain a key measure of success or status for a motorcycle. Having said that, these bikes, led by the Ducati campaign, will reinforce the joy of riding notion, no matter what motorcycles we ride. It will help some riders rediscover the pleasure of riding a motorcycle which has lost itself behind windscreens, fat seats, cruise control, traction control, extreme horse power, and even automatic transmissions. Most importantly, it will bring a new group of riders into the fold, people who have never ridden a motorcycle before. For all of the above, the Scrambler Ducati will be written as a new paragraph, perhaps a chapter, in the motorcycle history book. Meanwhile we will continue to customize our bikes, ride old or new bikes, and define our own joy of riding. This entry was posted in Bike Reviews and tagged moto guzzi v7 II, scrambler, Scrambler Ducati, scramblers, triumph scrambler. Bookmark the permalink. 1 Response to Back to Basics: Scramblers!